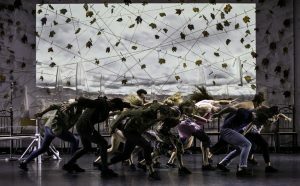 Former Riverdance principal dancer Breandán de Gallaí’s latest creation, ‘Aon’ (Gaeilge for One; Single; Alone), explores what it’s like to be unattached in the digital age of internet-dating and smart phones. de Gallaí has teamed up with a stellar cast of Irish dancers to bring us a story of uploaded personal profiles more in line with who we think we should be rather than who we really are. ‘Aon’ spins an intriguing narrative delivered through dramatic Irish dance with a modern twist, and performed to a wonderful, but all too familiar, soundtrack. ‘Aon’ encourages us to throw off our masks, to shed our armour, and to join in a dance of liberation. Aon (Gaeilge: One; Single; Any) spins an intriguing narrative through a tapestry of visuals, sounds, text, music, and contemporary Irish dance choreography. The show illustrates the human journey towards belonging using the digital age as metaphor. Centered around a selection of archetypal characters – their histories and personal narratives movingly familiar – we experience the pitfalls and challenges associated with navigating what can be a lonely road in search of connection. Harnessing postures and idiosyncrasies associated with the new media age, each character communicates an aspirational and longed-for ‘brand me’ – an imagined and constructed identity – eventually confronting the delusion of presenting themselves as someone slightly ‘better’ and coming to terms with who they really are. Aon is about identifying who we really are; the me that longs to be seen. At the heart of this is connection, or lack there-of. Connection is why we are here; it is what gives purpose and meaning to our lives. Aon challenges us to strive for a sense of worthiness, to fully embraced vulnerability, to be willing to let go of who we think we should be in order to be who we are. The show climaxes with catharsis … an unmasking … a shedding of armour … a dance of liberation … It encourages us to embrace of our authentic selves, and to strive to be unburdened by the imagined and projected constructs of others.